Oh real sugar. How do I love you. You're especially fantastic in soda. But poor sugar, constantly cast away for the cheaper, sweeter abomination of high-fructose corn syrup. What a shame. However, sometimes real sugar is used and it makes me so very happy. Last time it was Mountain Dew Throwback. 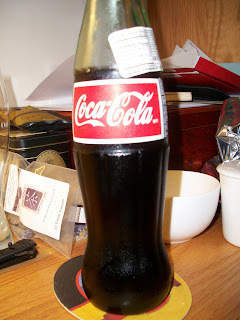 This time it's real sugar Coca-cola, commonly referred to as "Mexican" cola because it's made in Mexico and therefore doesn't have to be made of highly processed foodstuffs and artificial everything. Seriously, the ingredients are just: water, sugar, caramel color, phosphoric acid, flavors, caffeine. Reading a normal bottle of Coke is like reading the ingredients to a shampoo bottle. Disgusting.